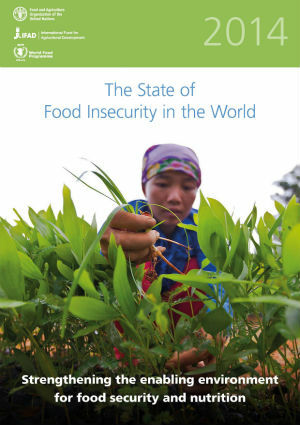 The State of Food Insecurity in the World 2014 – One Billion Hungry: Can We Feed the World? Results from this wide range of indicators show that food availability in still a problem in poorer regions such as sub-Saharan Africa. Access has improved considerably in many places largely where economic growth, rural infrastructure development, social protection programmes and poverty reduction have occurred. Utilisation is identified as the largest challenge for food security and levels of stunting, wasting and malnutrition in children remain high. Stability is also challenge particularly in regions that are heavily dependent on international food markets for domestic supplies and have limited natural resources with which to produce food such as the Middle East and North Africa. The report summarises that “the greatest food security challenges overall remain in sub-Saharan Africa, which has seen particularly slow progress in improving access to food, with sluggish income growth, high poverty rates and poor infrastructure, which hampers physical and distributional access”. Creating enabling environments, which the report explores across four dimensions – policies, programmes and legal frameworks; mobilization of human and financial resources; coordination mechanisms and partnerships; and evidence-based decision-making – requires sustained political commitment and prioritisation of food security and nutrition at the top of the political agenda. Being broad in scope, an enabling environment also requires an integrated approach, requiring transformation in numerous directions such as rural development, the investment climate, social and environmental protection, access to technology, specific nutrition and health programmes and strengthening of resilience to natural disasters and conflict. A variety of sectors will need to work together to confront the immediate and underlying causes of hunger and malnutrition – in agricultural production and productivity, fisheries, forestry, social protection, public works, trade and markets, education and health etc. A challenge then to developing an enabling environment for food security and nutrition is overcoming the compartmentalisation and competition between stakeholders’ interests and goals. The report states that coordination between such stakeholders, and between the private sector, public sector and civil society, requires an enabling environment but we would argue they also need to be part of the process of building such an environment. The report fails to address how better coordination between stakeholders might be achieved. Sustained political commitment at the highest levels, as seen in Malawi. Social participation and involvement of a wide range of stakeholders in policy processes, including those typically marginalised, to create more equitable policies, as in Brazil. Stable legal frameworks to ensure that government, civil society and other groups work together responsibly even during times of crises. A coherent approach across multiple sectors. Better coordination and governance mechanisms, a clear mandate, and well-defined roles and responsibilities, as in Bolivia, to prevent the creation of redundant, incoherent or contradictory food security and nutrition programmes and policies by different agencies. The development of effective policy tools and instruments based on sound analysis and using appropriate, accessible and inclusive information systems. The report mentioned several times the poor progress of sub-Saharan Africa but failed to dig deeper into the causes or into whether this a broad finding across all the countries of the region. Because of the global role of the FAO it is unexpected that SOFI would present recommendations or conclusions to any level of specificity. Nevertheless the findings are very broad lessons that many organisations and governments already struggle with. Although progress in reducing hunger is being made, it is being made relatively slowly and it seems, from this report, that it is the more institutional and political barriers that are holding back significant levels of progress.